The mechanical engineering sector is working constantly to find ways to optimise machinery, improve machine availability and minimise fluctuations in production. Integrating high-performance measurement capabilities into control systems can help initiate new development approaches that overcome performance limitations once considered insurmountable. The new ELM314x Economy line of EtherCAT measurement modules opens up this path to innovation for an even broader diversity of machinery. Programmers and engineers looking to advance machine development often run into at least one technological hurdle at some point or another that stalls further performance gains. The problem areas can be many and varied – physical as well as electrical – and they broadly affect all the machines of a given type, even from multiple vendors. The key question is how machine planners can deal with these challenges they are faced with. When it comes to controlling machines in a closed loop or gaining greater visibility into machine processes, the EtherCAT measurement modules from Beckhoff offer a right-fit solution by allowing high performance measurement technology to be incorporated directly into the control systems. • During first-time commissioning, installation troubleshooting and process fine-tuning. • During operation, to monitor operating sequences and production quality, measure vibration, monitor power, check results and predict the need for maintenance. • In maintenance, to verify that the work carried out has achieved the intended outcomes. In all these cases, measurement technology adds value by delivering insights gained from carefully planned measures to achieve greater visibility into a machine’s inner workings. But for this to succeed, measurement applications must be planned in from the outset, during a machine’s conceptual design phase. After all, if there are no sensors in place to measure something, either directly or indirectly, no measurements can be made. Only users who are thoroughly familiar with a given process can make informed decisions on where it would make sense to take measurements within a machine. That said, novel types of measurements can also produce surprising new findings that allow processes to be optimised further. 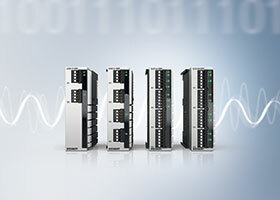 The 1 ksps Economy line of EtherCAT ELM measurement modules is the second category of integrated measurement technology to be released by Beckhoff. The basic ELM3x0x line rolled out previously, with sampling rates of 10 to 50 ksps per channel and an accuracy of 100 ppm, is designed to support highly dynamic measurements – rapid sequences of movements, load reversals or alternation of the kind that often occurs on test rigs and benches. The same terminals can provide compelling insights into processes in high speed production machines as well. However, many production processes do not require such fast sampling rates. This is why the new ELM314x Economy line with 1 ksps per channel was developed. It fits perfectly with the movement sequences of mechanical machinery yet offers the same capabilities and works in exactly the same way with TwinCAT software. Plus, there is the compatibility advantage as well. So if, for example, a machine should become substantially faster at some point in the future, the EtherCAT measurement modules can simply be replaced with faster ones with minimal effort, and measurement can continue as before. The new ELM314x Economy line currently comprises 2, 4, 6 and 8-channel variants. The modules allow high precision measurements with 100 ppm accuracy over a wide temperature range, at low per-channel cost, and can process analog signals in the ranges from ±1,25 to ±10 V, from 0 to 10 V, from ±20 mA, and from 0/4 to 20 mA. The ability to monitor and diagnostically analyse measurement performance is of key importance for any user. This applies not just to machines operating continuously but also to test rigs that need to run over the weekend, and even short-term testing tasks. Cable breakage, short circuit, overheating and disruptions to the power supply are just some of the issues which, at best, might cause an interruption of the measurement process and, at worst, falsify the measurements recorded without being noticed. Measurements of the kind taken unattended, deep inside production machinery, must therefore be able to anticipate such faults from the outset and report them reliably in the event that flawless measurement results can no longer be obtained. The EtherCAT measurement modules from Beckhoff are designed to do just this. Self-diagnostic capabilities account for a significant proportion of the device firmware and hardware. For users, this means that they can rely on the modules to detect and report commonly occurring faults and only ever return reliable measurement readings to the control system. • The transfer rate of 100 Mbit/s is sufficient for several 100 analog channels, each with a sampling rate of 10 ksps. • The distributed clocks system allows synchronised data capture on a large number of channels and terminals, at long distances, with an accuracy of up to ±100 ns. • The proven, consistent parameterisation of EtherCAT slaves via CoE, and data transport via PDO is already familiar to the users. Given that PC-based control technology has always been used to equip even extended plants with EtherCAT, the Beckhoff portfolio not only incorporates measurement terminals and the means to implement TwinCAT functionality, it also includes numerous EtherCAT infrastructure components spanning the entire measurement chain. The latter include the following: optical transmission equipment such as couplers and fibre-optic media converters for environments with a high EMC load; the CU2508 family of port multipliers for parallel EtherCAT data streams requiring transmission rates in excess of 100 Mbit/s; and couplers with ID switches to support flexible topologies and in general, the fault-tolerant redundant EtherCAT cabling. In many fields, computer-aided simulation is used to trial a wide range of ideas in advance, thus reducing subsequent testing time, effort and expense. It can be highly worthwhile, especially with the kinds of complex systems that cannot be tested extensively in advance. With systems like these, simulation may be the only viable way to find the right approach to a solution. It can also help to identify the best locations for sensors within a machine, or, alternatively, show that certain sensors could be left out if the information they would provide can be obtained by other, possibly indirect, means. This might sound as if measurement technology could become redundant in the long term. Doubtless, simulations can be run under a wide range of repeatedly changed starting conditions, and can save a lot of time. However, the fact remains that applications must always be tested, time and again, against real-life conditions as well. A simulation model has to be compared repeatedly with how the actual machine it represents behaves. Precise measurement data obtained from the machine itself showing actual timings and quantities is essential. Without this feedback, the model would evolve in isolation, and any simulations run would produce unrealistic results. High quality, built-in measuring technology ensures a steady flow of information from the machines, and the various measurement channels, if set correctly, provide exactly the control data needed to refine the simulation model. High quality measurement data is also crucial in another entirely different field of application where virtual world data and real world data are combined: hardware-in-the-loop testing). Here, tests and measurements are conducted on a device, and the data collected is fed back into a test model in real time. If incorrect measurements, dynamic inaccuracies or deviations occur, testing is no longer possible. HIL tests of this kind are now performed on many production machines, and this calls for measurements to be conducted under production conditions, with short cycle times. These are genuine high speed measurement tasks where precision is essential, and Beckhoff increasingly is equipping test benches with EtherCAT measurement modules for this very purpose. Looking ahead, the emphasis placed on equipping various types of machines with measurement technology may shift as machine vision systems and advances in sensor technology give rise to new solutions for new requirements. However, continuous measurement in some form will always remain part of the process. Beckhoff, with its EtherCAT measurement modules in general and the new ELM314x Economy line in particular, has successfully introduced a valuable class of component to electrical measurement technology that serves this purpose well. With the addition of machine vision technology to TwinCAT, optical measurement is becoming increasingly important too, and Beckhoff will continue to rank as an important equipment supplier for advanced and sophisticated machinery, helping to future-proof not just production machines, but end customers’ processes as well.